Does Shildt think you’re a No. 1 starter? He does not, no. I'm not lefthanded. A back end bullpen of CMart/Hicks and Miller would be as good as any in the MLB. Perhaps. Cardinals would prefer to get 190 innings from Carlos Martinez and not just 80, but that's something they'll have to determine if its feasible during spring training. Will the Cardinals try to trade for Leury Garcia? He will fill in the holes the Cardinals have and the Sox will need a big bat in their line-up if they do not get Machado and if they do get him, they need another big bat. An interesting question. Don't see the Sox eager sellers in this regard. They were able to get Garcia on a deal before getting close to this past week's arbitration exchange, and it's a good deal too for the team. Garcia is the switch-hitting utility infielder that the Cardinals do crave, absolutely, and they haven't had much luck flipping Jose Martinez into a lefty reliever or utility fielder of their liking. They did receive offers of prospects for Martinez, but that wasn't the move they were trying to make, and that's why they've moved back from trading Martinez. 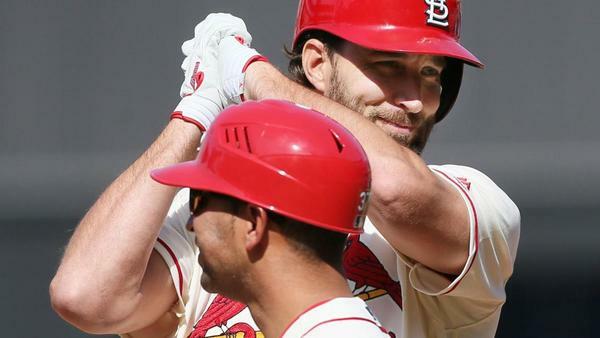 Two things stand out: Sox seem like they've got a good deal to keep Garcia and it sure seems like it makes sense for the Cardinals to aim higher if they make a trade like this. With the Machado market sounds like it stuck at 7-8 year range, can you see the Cardinals being a player? If they are would would you move, or would you do a super utility type with the odd man out? Let's take this question backward in order to build a sense of drama. If the Cardinals were to add a player like Machado and he insisted on playing shortstop, then the movement would happen like this: DeJong to third, Carpenter to RF or LF, and then Fowler into a part-time role or a time-share in RF/CF with Carpenter moving around a bit (2B?) and Bader not starting everyday in CF. That's how that would work. That said, there is no indication the Cardinals are leaping into the Machado derby, and, in fact, it has been dismissed a few times here recently when I asked around about the Cardinals being a late entry into these talks. A few things here. According to multiple sources this winter, the Cardinals have been telling other teams and agents that they are content with DeJong at shortstop and not looking for a move at that position. Also, the Cardinals have not hid their reluctance to offer longterm deals. They've scaled that back significantly. I've reported before that the Cardinals see a five-year deal for Goldschmidt as more palatable than the commitments necessary to go after the headline free agents. We can certainly debate their position on that, especially with the headliners behind three years shy of 30. Probably won't change their stance on that, and it doesn't seem like Machado will have to go with a 5-7 year offer like the Cardinals, not with the offers Jeff Passan and Bob Nightengale have reported him already receiving. One additional thing: There was a sense in the Cardinals' evaluation process that Machado was the better longterm bet (longterm bet, not better value or better player or better hitter or better signing) than Harper based on the positions they can play and will play through the life of the contract. Thought that was interesting. We'll know more this weekend. He has been through several re-evaluations of his recovery from surgery, and the Cardinals' plan had him entering a throwing/strengthening program this month with the idea that he'll enter spring training close to full strength, but possibly under some caution flag. He's set to go through an evaluation with the Cardinals' medical team in the coming week, and the results of that will give us a good sense of his recovery and the work he's done this winter. Does Gomber have the stuff to be Andrew Miller 2.0? Not if he's a starter. And he could be a starter. With Passan's report of Machado receiving a 8/250 offer from the White Sox; did the market dip enough for the Cards to jump back in? I'm not sure it gets much better than signing a player of his caliber and getting the most of his prime years of 26-34 years old. It's going to be hard to beat that production/value wise. Explored this early in the chat and I imagine we'll talk about this often throughout the chat. I get where you're coming from -- and it makes sense. Rare is a talent like that available on the market at that age. I wondered the same thing you did and attempted to find out if that was the case -- were the Cardinals going to get into these conversations. There is no indication they have. I've been told even today that they weren't wading in. I talked to a source this past week and got a real tepid response when it came to what it would take for the Cardinals to engage at this point. You could read that a couple of ways: One, the Cardinals don't like that commitment, as reported. Two, they know the market has already moved past that reported offer. Derrick - How do you think Fowler would react if O'Neill regularly replaces him in RF when the Cards have a late-inning lead? Fine, I guess. Maybe has a challenge to improve defensively, for sure. Odds on landing on Asdrubal Cabrera or Marwin Gonzalez? Well, there are actually odds on landing Cabrera. Like, that makes sense. And the Cardinals have the kind of opportunity he would fit. There aren't any odds on landing Marwin Gonzalez because he wants to start, and he's being sold as a starter, and he'll aim for some kind of Zobrist-like role with a team, and that's not where the Cardinals are shopping. They weren't last week when we talked about him. They weren't the month before when we talked about him. And today he's still looking for an opportunity the Cardinals aren't really going to have for him. Yes. Lots. They spent a lot of time this past year around first base, talking, doing footwork. Of our 5 number 1 starters, who would you predict to have the best season and why? Miles Mikolas. Recent success. How he achieved that recent success. Style. Experience. Durability. Consistency. Any more bullpen pieces being looked at? Absolutely. The Cardinals have adopted a position right now that they're happy with their pitching staff, and Mike Shildt's comments to Rick Hummel about the rotation are part of that. That said, they see options out there in the same way they did with Bud Norris a year ago. They're out there open to that kind of addition. Wouldn't be a shock at all if the Cardinals add a starter that way (Kyle Lohse-style) or make a move for a Norris-like pitcher that could help the bullpen. There are so many pitchers still available, and Gio Gonzalez has yet to find a home. Do you expect a chain reaction of moves following the Harper/Machado signings? Is that the main hold up? Sure seems that way. Especially with a handful of remaining, name-brand free agents represented by Boras, who could do the Harper deal and then move on to other clients and start placing them. Why is there talk of Munoz and Jmart not making the 25 man roster? And more talk of getting Marwin Gonzales who hit .235 against RH pitching? Talk of Drew Robinson making the 25 man roster when he hit .170 against RH pitching? Jmart hit .313 and Munoz hit .280 against RH pitching. In the time of Saber metrics and the Cardinals seem to be obsessed with getting someone who bats left handed. Can someone explain this? I have no idea where you're getting this "talk." Jose Martinez is on the 25-man roster if he's with the Cardinals, and every indication as now is that the Cardinals aren't shopping him anymore. Yairo Munoz will have to win a spot on the roster through his play in spring training, and part of that may be his ability to play the outfield. Now, if he gets into a spot where he only plays as well as someone who hits lefthanded, then that's going to be the tiebreaker. Lefthanded bat is important as a counter in late innings. Like Greg Garcia was, and like Greg Garcia did well. Better hitter is always more valuable, but if it's even, lefthanded hitter is going to get the nod. No one has guaranteed Drew Robinson a spot on the 25-man roster. He'll be part of the competition in spring training. This "talk" you mention doesn't have much gravity. Sorry. Is the familiarity aspect with Harper overblown? The Cards have been playing against him for years now. They know the guy and his numbers . I guess. That's not what they're talking about. They're talking about work habits, personality, fit in the clubhouse -- all the things that all teams suggest they get to know better by having a player on the team. That's not to say they can't research it. And teams do. They go wherever they can for information about a player and his work habits and his personality and all of it. The better they are getting that intel, the better picture they have of the player beyond his statistics, etc. Thanks for chatting. In your opinion, if the Cards are unable to retain their FA SPs in 2019-2020, do they have enough quality in the upper minors/BP to go with in-house options? Not if they intend to contend for a division title, no. I just read in Mr. Hummel’s article our manager discuss the performance team and medical team. You’ve reported on plans to keep Andrew Miller healthy. Is there a new organizational medical approach? Handling injuries hasn’t been a strength recently, it seems. A few years ago, the Cardinals founded a Department of Performance, and that group has grown, its influence has followed, and its confidence in the work its doing has also improved. So, it's not been a change from this winter, rather it's been an evolution of a program the team adopted several years ago and has been adding and advancing and improving with the intent of having it be more of a presence in the majors. Players like Jordan Hicks, Jack Flaherty, and Paul DeJong have all had exposure to the department from their minor-league days, and their results and performance and health has emboldened some of the approaches to then get a better foothold in the majors. That's the Cardinals' goal, and, again, it has been for several years. When making a statement about "handling injuries hasn't been a strength recently," you should always keep in mind that there are 29 other teams that also deal with injury, and any of the things anecdotally that you can think of with the Cardinals have also happened with a handful of the other 29 teams. Agreed. And I don't understand the A's leverage at all. It seems to me that Murray can always count on baseball being there for him, and only has this one chance to strike it rich as a high-round pick in football. It seems like his play is to go in the draft, get the guaranteed money, and try football, and if it doesn't work out then he's got baseball to go back to. That's what we've seen other players do. I get why he's asking for the A's and MLB to --- um, let's say, explore the elasticity of the rules ... but how can they overcome the perception that baseball will be there if football isn't. There is chatter that there is a mystery team involved with Machado and Harper, respectively. Is this true or just Boras leaking that? If true, what is the chance one could be the Cardinals? I imagine it's true. I imagine it's all part of the game. I imagine it's trying to generate a perception of the market or it's trying to get the reporter off the phone without revealing details. I imagine it's code for there are seven teams involved and six are known and one is not. That's usually how it goes. It's become the lingua franca of the market when an interested team isn't identified. I have not been able to find a source who will tell me they imagine the Cardinals being that team.